Macaroni and cheese has been my favorite food pretty much since I was able to eat solid food. As such, I was pretty excited to try making a vegan version of my favorite dish. One of the people I am living with right now has been vegan for two years, and has a cookbook called Let Them Eat Vegan by Dreena Burton. I decided to make the recipe called “Mac-oh-geez”. I preheat the oven to 375 degrees Fahrenheit and lightly greased an 8 by 12 inch baking dish. I cooked the pasta in slightly salted boiling water for 6-8 minutes, until al dente. It is important to remember that the pasta will keep cooking in the oven. I put all the sauce ingredients in a blender, but reserved 1 cup of the soy milk. I blended the mixture until smooth, then added the rest of the soy milk and blended it some more. 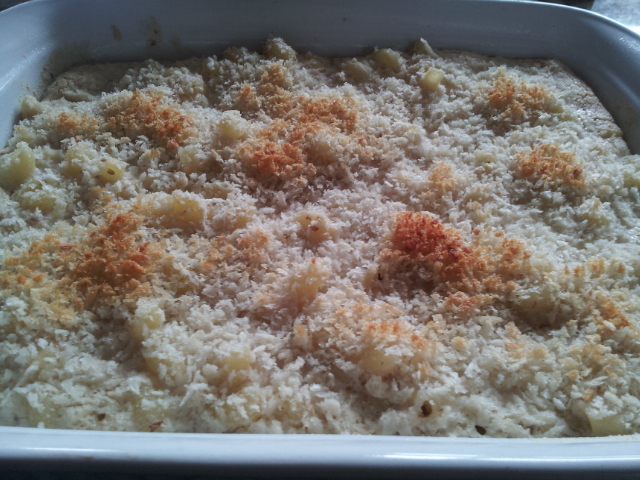 I put the cooked noodles into the prepared baking dish, and poured the sauce on top. It looked very saucy, but it really thickened up in the oven. I mixed the bread crumbs and oil together and poured on top of the casserole, then covered it in tinfoil and baked it for 17 minutes. Then, I removed the tinfoil and baked it for another 7 minutes, until the top started to turn golden brown. Overall, the mac and cheese looked exactly like the casserole I make with cheese, butter, and milk, and it tasted similar, but of course, not bang on. There was a slight sweetness to it that I am trying to understand; maybe the soy milk is responsible for this, even though it was unsweetened. But, with a little bit of pepper on top, and this dish can definitely satisfy the mac and cheese craving. Funny side note: with my peanut allergy, it can be very difficult to find nuts that were not processed on the same equipment as peanuts. Usually pistachios are easy to find in the grocery store, but not much else. Thankfully, Costco sells a brand called Kirkland that has many different options that are not processed with peanuts. I was able to buy a bag of almonds, but the bag of cashews had the “may contain” label on it. However, I found a bag of mixed nuts and fruit that were safe and had cashews in it! 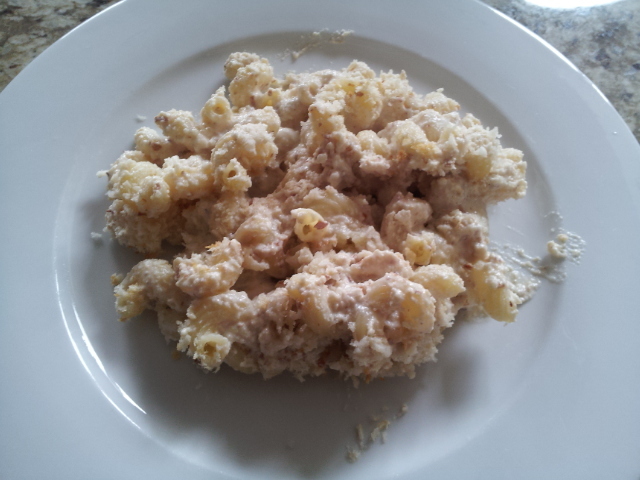 So, for this mac and cheese recipe, I picked out the cashews one by one. Yes, these are the lengths I will go to to try out a new recipe. I am impressed by your vigilance with the cashews!